Seventy-six percent of the patients we serve are children. We use this blog to give them a voice and shed light on a crisis affecting so many families. Honor their bravery during Childhood Cancer Awareness Month and join us in sharing their stories. 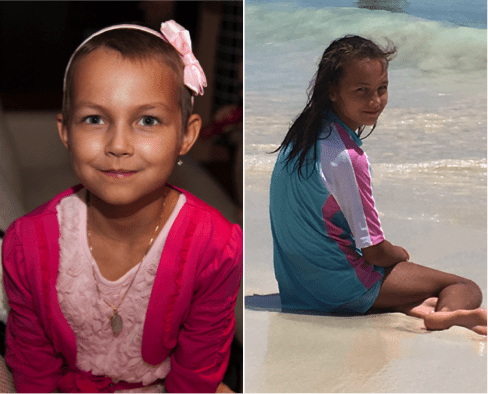 Weronika was diagnosed with acute lymphoblastic leukemia at 8 years old. She was in and out of the hospital for the next year, managing the disease and receiving frequent transfusions. After the first month of balancing work and taking care of her daughter, Weronika’s mom, Kasia, had to quit her part-time job. Weronika’s dad also altered his work schedule to care for her two brothers. This drastic change severely affected their income. The family’s social worker connected with Family Reach when she realized the strain they were under. Our community stepped in and provided a grant to cover their car insurance and car payment, ensuring they could maintain safe, stable access to treatment. Weronika has bounced back from cancer and is enjoying middle school! After 10 months of intense chemotherapy followed by 20 months of additional care, Weronika’s two-and-a-half year treatment journey was over. Weronika remembers the nurses and doctors, the gifts, the people who helped, all the care, attention and support her family received throughout this difficult journey. “She is a survivor and so grateful! Thank you to everyone who helped us in that fight,” said Kasia. Donate today and help families like Weronika’s get to the other side of cancer.